Neonatal screening is a test that can identify over 20 different disorders in newborns with only a few drops of their blood. The test aims to support the healthy development of your baby though early disease detection. The screening is offered free of charge to all newborns delivered in Sapporo. Neonatal screening is conducted by local goverments throughout the country. What is biliary atresia (胆道閉鎖症Tando-heisasho)? It is a disease in which the duct between the liver and the intestine is clogged and bile cannot be discharged. As a result, jaundice and pale or clay-colored stools develop. This disease can be treated only by surgery. If the treatment is delayed, serious liver failure would occur. Therefore early diagnosis is necessary within two months of age. Check the color of the baby’s stool three times, the first time at 2 weeks of age, the second time, on the day before the baby’s one month check-up and the third time between one month and four months of age.Choose the number from the color test chart that matches the color of your child‘s stool. The color chart is attached to Boshi-techo, maternal and child handbook. The colors on the web might look different from the real colors on the card. Use the color chart on your Boshi-techo. Keep an eye on his/her stool color up to about 4 months of age even after submitting the card during his/her one month check-up. You need to consult with medical health staff immediately, if he/she still has yellow skin and eyes and dark yellow colored urine after 2 weeks old. 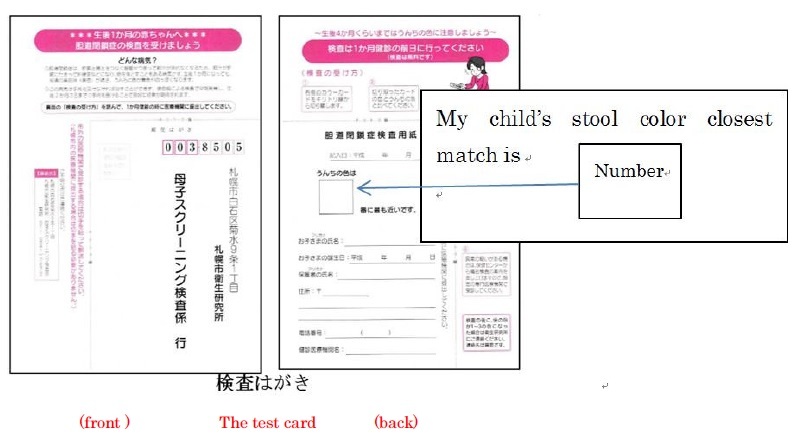 You need to give the test card with only the second test result, which was checked on the previous day, to your hospital at the time of your baby’s one month check-up or mail it with a 62 yen stamp to the Sapporo City Institute of Public Health by surface mail. The said test card is only available in Japanese and is attached to only Japanese Boshi-techo. Your hospital can provide it to you upon your request. Please ask the public health center for the card, if you can’t get it by the time of your baby’s one month check-up. If there is no response about the test for two weeks, your baby is normal. If the test’s result is positive, you will be referred to a hospital that specializes in this field of medicine. 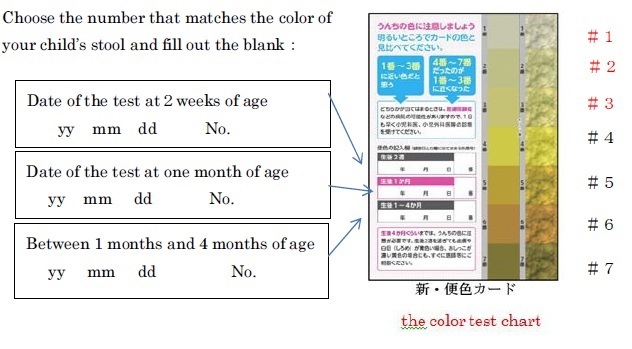 If the said color matches #1, #2 or #3 of the color test chart at 2 weeks of age, please directly contact the Sapporo City Institute of Public Health.